A little more about my ultrasound, plus some of my standard gushing, over at Faith and Family Live tonight. I feel like my nausea and exhaustion are the only things keeping me real these days. Otherwise I would be nothing but sunshine and rainbows overflowing, and it would be a little... much. Still, I can't help but recognize that, currently, a list of my blessings would be as long as my arm. Longer, even - it'd probably go from my shoulder to my hemline. 2. The embryonic (almost fetal!) little one, of course. 3. Camilla's new sleeping habits! To prove I'm not superstitious (even though I feel I should be whispering this) I'll share: she often sleeps from 10pm to 6am straight through! Then nurses and goes back to sleep for several more hours! Can you tell by all the exclamation points how excited I am that this has finally happened?!? 4. Getting to rediscover the world, and to discover for the first time what's going on inside that little head of our daughter's, because she is getting so incredibly verbal. Bryan and I have decided that if we could just get Billa to sleep reliably (the eight-hour stretch is not completely consistent), then life with her would be pretty much perfect. She can tell us what she wants so she's rarely frustrated, and she's just so funny and interesting. Of course we, being her parents, are biased in that regard, but still. 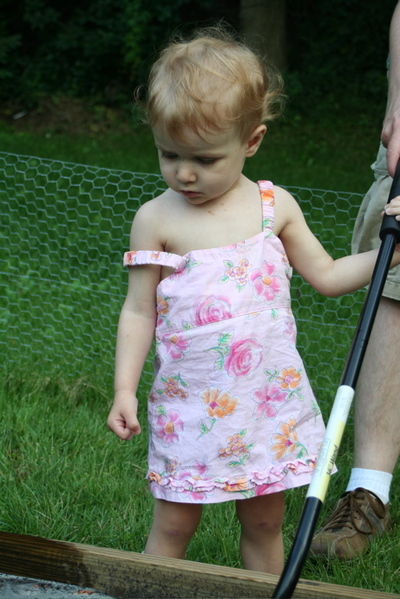 What could be more fascinating than watching a toddler learn to communicate and understand the world around her? It's a huge privilege. 5. 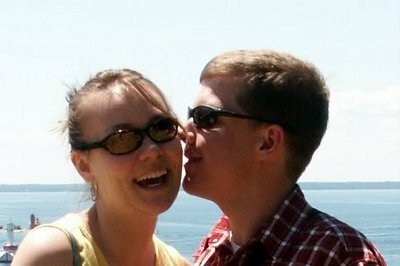 Bryan and I will celebrate six years of marriage on August 17th, and it's as good as it's ever been. Better, even. 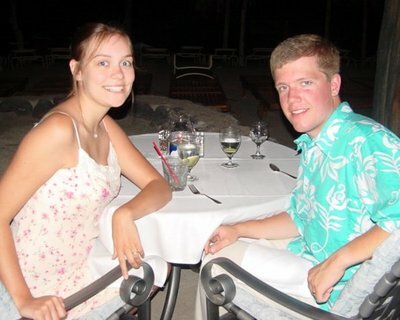 And this fall will be the tenth anniversary of our first date, which means we've had a good long time together. If the future decades of our life together bring as much joy as these first years have brought, we'll be pretty blessed. 6. We've got my sister and her family nearby - Daniel and Camilla are so attached they're like twins - and both sets of parents within easy driving distance. It makes me very happy that our kids will get to grow up knowing their extended families pretty well. 7. I often take this particular blessing for granted, but Bryan has a good, well-paying job, in a field with a lot of job security. He likes going to work every day, and his commute is only about fifteen minutes. In that area, we've got it about as good as it gets. 8. We have a house that's big enough to hold at least a couple kids (I figure we won't get really crowded until we've got four, if that happens), in a neighborhood we like, in a great location, so we don't have to move any time in the foreseeable future. I hate moving, so the thought of staying put makes me happy. 9. We love our parish. And I just heard from another mom that they do hands-on Montessori-style catechism - and our parish is very orthodox, so we can trust it to be good - and Camilla can start at age three. Fall 2009, here we come! 10. We're all healthy as horses. -1. I often feel like I might throw up. But after all the good things I listed above, it doesn't seem like that big a deal, does it? Sometimes I look around and wonder how I got EVERYTHING, why God has blessed us so much when there are so many with so little. Mostly, though, I just try to appreciate it, because life really is incredibly good. My last post of Nablop was going to be a long reflection on how happy I was that I'd done it, and how it turned out to be a blessing because I discovered that I can write it every day without burning out, and how in fact the more I wrote during November the more energized I felt to write, and yada yada yada big kick in the pants for my blog and come back! there will be more here regularly and all that. I'm glad I didn't do it, because it is now six days later, natch, and this is the first thing you're getting out of me since I posted that last Nablop post. The obligation to post every day in November was a grace to me in many ways because it removed a factor that has always paralyzed me when it comes to writing about my life on the Internet. I don't write for a while, and then I really want to write but I feel like it would be abrupt to just pick up where I left off without narrating the in-between stuff, but the prospect of that is tedious, so I delay some more, and... well, you all know where that got me in the months before November. However, for lack of anything else to say and because the past six days have been packed, here's a rundown of them. 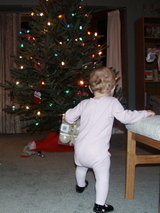 Saturday we got our Christmas tree, a big beautiful Frasier fir, and put it up and decorated it. Last year we did this during naps while our time-bomb baby slept her cradle swing a few feet away. This year, she helped. 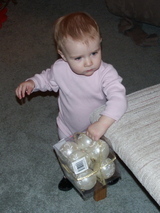 If there is anything more adorable than a 13.5-month-old toting around a box of shatterproof tree ornaments and delightfully exclaiming "ball!" over every shiny one she saw, I don't know what it is. Sunday we took a day trip to Frankenmuth, the oh-so-tourist-trappy but cheesily-delightful "Michigan's Little Bavaria." I have fond memories of the place from my childhood, and the day trip has become a yearly tradition for us and my sister's family. We eschew the "famous" mediocre local chicken and traipse around to local shops to gather sausage and aged cheese and bread and German pickles, and then we have a picnic in our car. On the way out of town we hit the world's most humongous Christmas store (this year we got ourselves a new tree topper) and we head home feeling like we've had a great time, even though we've been in town for only about three hours. We finished off Sunday by having friends over for dinner. The chicken was undercooked and the mashed potatoes were lukewarm and there was not enough broccoli but the company was lovely and the conversation was lively and it was a wonderful ending to a wonderful weekend. ...on Tuesday morning, when Bryan got on a plane to go out west on a business trip. The situation was marginally improved by the fact that I came back to stay with my parents for the three days and two nights he was gone. It wasn't too bad this time, and I stayed busy hanging out with my family and taking naps while Milla's kind relatives watched her. But still, I missed my husband and Milla missed her dad. In honor of Thanksgiving, I decided it would be neat to do a series of posts on things for which I'm thankful. I'm not sure how many I'll do. You'll just have to be in suspense. We could use a little more suspense around here. I don't talk about it much, but one of the things for which I'm thankful every day is that I get to be a stay-at-home-mom for Camilla. One thing I've noticed is that many people, and especially women, seem at least somewhat unhappy with their family's solution. They work outside the home but they've had to sacrifice time with their children, or they stay home with their children and love it but they've had to sacrifice extra income and pinch to make ends meet, or they stay home with their children because they think it's a good thing but they've had to sacrifice a job which they really liked. I won't go into much detail about how we got here - except to say that we always assumed I'd stay home with our child(ren), and planned ahead accordingly - but I will say that I feel incredibly blessed that our current solution to the income/childcare challenge is meeting our needs nearly perfectly. (I say "nearly" because our perfect ideal would be the independently-wealthy two-stay-at-home-parents solution, but that's not happening any time soon.) Bryan likes to go to work and I like to stay home with our daughter, and each of us feels that we've got the better end of the deal. He says he'd go crazy doing what I do. The best full-time job I've ever had was nothing more than a paycheck to me, so I don't feel like I'm missing anything. And there's never been anything that I did day-in and day-out that I was as good at, and that made me as happy, as this full-time motherhood thing. I love that every morning I get to wake up to meet my daughter's little blue eyes, and that every day I get to be with her, and that every night I get to go to bed secure in the knowledge that we'll be together the next day, too. I know that if our circumstances were different this might not be possible. I'm grateful that it is. Until due date: 11 days! As you might have guessed, the bambino has not yet made her appearance. At my OB appointment on Tuesday I was just over 1cm dilated and 80% effaced. The doc said we're on track for my due date; I know from other women that 1cm and 80% can last for weeks, so I'm hoping the doctor is right. He has delivered over 4000 babies, so he should know something. Now that I haven't gone into labor and we're heading out for the weekend, I'm telling Pahoehoe I'd prefer it if she'd hold off until we're safely back home on Sunday. If I don't post before then, you can assume all is quiet on the birth front. Meanwhile, go congratulate Emily! And enjoy the pictures of her beautiful brand-new son. Four years ago today, I got married. I was nineteen at the time - only six days away from twenty, but still a teenager on a technicality - and saying those vows was the first truly irrevocable thing I had ever done. I was a little nervous, but confident in the person whose hands I was holding, and even more confident in the One who had led us to take that step. Every day, I am thankful that we took it. As young as we were, we were very much in love then. I thought I could not be happier. But what we had then pales in comparison to what we have now. Today is our anniversary, a day for love letters and flowers and dinners out and romantic things like that. But a picture of love that includes only those things is like a picture of an iceberg that only shows the part above the surface of the water. The reality of our marriage, the way we live in each other's lives and love each other in the ordinary moments as well as the extraordinary ones, is so much bigger than can be expressed by mere romantic gestures. Come to think of it, words on a blog can't really do it either. I love this man with everything I have. That's all there is to it. And I always, always will. I’m ten weeks today, and it suddenly struck me that I have written little about where I am emotionally with this pregnancy. Of course, I have one basic emotion; I hope it comes through in my updates. I’m grateful. Unbelievably, overwhelmingly, every-moment grateful. Grateful in a way I can’t imagine I would have been if this had happened when we first started trying two-and-a-half years ago. But there’s other stuff going on, too. I didn’t talk about this before I got pregnant, but I’ve always been aware that, in the realm of infertility blogs, this one doesn’t exactly fit in. That’s putting it mildly, actually: I’m waaaay below the average age (far enough that I imagine more than one person read my profile and thought me ridiculous for complaining about infertility at age twenty-three); we weren’t actively pursuing adoption or treatment or even fertility testing; and I’ve written as much about theology and other random topics as I have about our quest for a family. I always thought it appropriate that my blog didn’t fit in, because I’ve also felt from the beginning that infertility was, for me, a different sort of struggle than the one most of the women around me in blogworld were undergoing. (I don’t mean this in a look-at-me-my-pain-is-so-unique way; bear with me here.) With my background, it was bound to be. It has to do with being Catholic, the particular brand of Catholic that we are. (I am on friendly terms with more people who don’t use birth control than most of you will meet in your entire lives, I imagine.) When Bryan and I got married at twenty-one and nineteen, lots of people, mostly friends of his parents, told us that we should make sure to wait a few years before having children. And I think that most people who get married at the age we did (assuming they’re not getting married because they already have children) plan to wait, to enjoy life together for a few years before they take on the responsibility of parenthood. But Bryan and I never planned to do that, because we believed we couldn’t, in good conscience. We did use NFP to avoid conception during our first year of marriage, when we had no income, but as soon as Bryan landed a job in the summer of 2003, we started trying. The rest, as they say, is history. It seems to me that most people start trying to have a baby because they want a baby. It’s part of what makes infertility so hard – seeing babies all around, and not having one of your own. I can definitely relate to that, as my desire for a little one to care for and kiss and love definitely increased as the months of our wait went on. At the beginning, though, the decision to start trying wasn’t about that. I was barely twenty-one at the time. I was concerned about midterms and research papers, excited about having my first legal margarita. The decision to start trying was one of obedience more than anything else; Bryan and I both felt strongly that now that we had the means to provide for a child, we had the responsibility as Catholics to be generous with our fertility, and to let the children come if that was what God willed. In the meantime, I was busy. Ever since I had started kindergarten in the fall of 1987, I’d been a student. My parents impressed on us from the time we were little our responsibility to be good stewards of the talents God had given us, and in the academic realm, I found, I could use my talents well. I loved math, science, history, politics, literature, philosophy, theology - and, especially after I transferred to my little liberal arts college, got a lot of fulfillment out of learning and out of communicating what I had learned. I may have dreaded writing those papers and procrastinated on them until the last minute, but I discovered, again and again, that the writing itself was actually enjoyable for me. Heated class discussions felt like my natural habitat. “Student” was a good identity for me. During my last year of college I watched my classmates face, as college seniors everywhere must, the question: what comes next? Some made plans to go to grad school or seminary – they would continue to be students, at least for a while. Others found jobs – they would be teachers, or construction workers, or cubicle-dwellers for faceless corporate entities. A few girls had plans to get married right after graduation – they would be wives, and soon after (they expected) mothers. I identified the most with those who struggled with the challenge, who had found no plan to fit them, for I considered that I was among them. I’d had my identity planned out for as long as I could remember – as a student until I graduated from college, and then as a wife and stay-at-home-mom. I’d jumped the gun a bit on the “wife” part, but the “student” part still sufficed as identity for me. Now I was losing it, and the “mother” part didn’t seem to be coming along, and the questions loomed. What would I do? Who would I be? A job dropped into my lap moments after I graduated, and I seized upon it as the answer to my dilemma. Now I was no longer a student, but I was a paralegal. As an identity I imagined it would work just as well. Unfortunately, as I discovered in the following months, “paralegal” was not an identity that fit my personality and talents the way “student” had. In fact, it made me miserable. I hit rock-bottom before I gave my perfectionist self permission to bail on that one, and was surprised at how relieved I felt. But still I was faced with the question: who am I? It was the part that always hurt me the most about infertility, not being able to take on the role I’d always expected to take on, a role for which I believe I am well-suited. 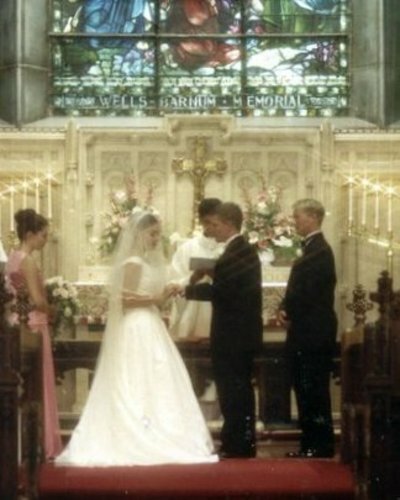 My parents got married when my dad was still doing his undergrad work, and they had me and Rosie before he graduated. They were very poor for a few years, but they felt confident that God was calling them to have children, and so they did. Along the same line, I know many young Catholic couples who struggle with their finances in order that they make continue to be open to the children God sends them. (No joke, I know a couple who got married four months after we did who are already expecting their third.) Young, poor, but fulfilled and happy – it’s the story of these years for them; it was the story of my parents’ early years; I always imagined it would be the story of mine. Instead, we’ve got a house and two cars and we travel and go out to dinner and have a Netflix subscription and never worry about where that next meal is coming from. We’re not rich by any standards, but we’re comfortable, and I know people who can’t even imagine what “comfortable” feels like. I am not complaining about the fact that I don’t have to pinch pennies, but when I got married at nineteen I imagined that penny-pinching would necessarily be in my future because children (early and often) would also be. I am grateful for the fact that we’re comfortable financially, but it is not worth it; I would much rather have had those children than the extra cash. After I found myself in the middle of a depression and got up the courage to drop the impossible identity of “paralegal,” I started thinking about my identity crisis. I had imagined I would be a mother by now, poor but happy, and instead I found myself in an empty house, with a third bedroom that sits unused almost all the time, not needing to work but with little to occupy my time otherwise. I pondered for a while (weeks, not just hours) and, as always seems to be the case when I pray and ponder hard enough, found myself with a solution of sorts, with an identity that fit me, at least fit me far better than “paralegal” had. I started applying myself to housework, meal planning, etc., and found that, when I took care to do it well, it occupied a lot more of my time than I’d expected. But in addition (and this is the key part, I think), I embraced the fact that “waiting to be a mother” can be identity, too. I’d prayed and begged and wrestled with God for long enough to realize that the answer of “Sure, go ahead and [adopt, do fertility treatments, etc] right away” was not forthcoming. I had the choice: reject what I was hearing and go ahead with my own plan, or accept that “one who waits and hopes” was meant to be my title for now. The first was never really an option. So I accepted that hated identity. I didn’t necessarily accept it gracefully, but I accepted it, and found a lot more peace than I had expected to find. It surprised me that the new identity seemed to fit me so well, although it shouldn’t have. Like any true vocation, it was bound to fit. But then, before I knew it, I was pregnant. And it completely floored me. I was not prepared for the abject fear that rolled over me moments after I saw that second pink line. I wrote this post the day after I found out I was pregnant, and the fear I was talking about had been brought on almost completely by my pregnancy. The pain of “sorry, not this time” that I faced each cycle was something I knew I could handle, having been through it so many times before. The pain of losing a child, even an embryonic one, was something I couldn’t face. I think that the pain of missing identity was the hardest part of infertility for me. Now that I’m facing the possibility, more real with each passing week, of giving birth and dedicating myself to taking care of that little one, the missing identity of “mother” is within my grasp. It’s an adjustment, and it (already!) involves sacrifices, and I am much, much more vulnerable here than I ever expected to be. It’s true. I don’t know how to do this. But fortunately we humans are an adaptable race, and this is a happy adjustment. I’m unbelievably grateful to be making it. And I have thirty more weeks to do it, so all will be well. Pregnant! Me! Still surreal, but you won’t find me complaining. For someone who is the oldest of six children and spent hardly any of her first two decades alone, I think I am remarkably good at handling solitude now. Or perhaps it’s because of those first two decades that I can handle solitude. When I was younger it was very hard for me to get a quiet moment alone, so now I’m making up for that. Often, I relish my time alone. Which is good, because I’m alone tonight. I can hear you gasping. Alone on Valentine’s Day? Her husband always sounds so sweet when she talks about him! How could he do this to her? Rest assured, Bryan is still wonderful and I am still loved by him. He’s in DC tonight because he had to do mandatory training for work, and he could either do it today or the 28th, and on the 28th we’re going to be on a trip that he’s planning as a surprise for me. So you see he’s still eligible for his World’s Greatest Husband title. I’m thinking tonight about Valentine’s Day four years ago. In case you’re really bad at the math, that was early 2002. We were both at the same college; I was a sophomore and Bryan was a junior. We had a date to go out that night (just for dessert, not dinner, as it was a Thursday and he had a meeting that lasted until nine). And I knew he was going to propose. Where were we? Oh, yes, it was meant to be a surprise but wasn’t, because I don’t happen to be an idiot. Bryan’s hands were sweaty and he was jittery and he kept patting the pocket of his jacket. It took me about .2 seconds to figure out what was going on, or would have taken me .2 seconds if I hadn’t already known what was going on, as a result of the fact that Bryan’s father (incidentally, a jeweler) had driven into town (a three-hour round-trip) the following evening just to meet his son for dinner. Clearly it was a ring drop-off, and I knew Bryan wouldn’t be able to hold on to it for long. So we sat there, eating carrot cake, and he knew what was coming and I knew what was coming, and the minutes feel long and dry and shaky. In principle I like romance to be dramatic but in practice I’ve found that I don’t really enjoy the drama, that the most romantic moments are the simple ones that I don’t anticipate at all. I wanted the proposal to be over so that we could enjoy being engaged. Fortunately, before I knew it we were walking again, and despite the cold, an evening walk on campus is not an unpleasant thing. Then we were under this tree, beside this bench (it’s Michigan in February, what do you expect, waterfalls?) and he gave my Valentine’s Day card. Actually, he gave me another Valentine’s Day card; if I recall correctly he had already given me at least two that day. Then he got down on one knee and asked me to marry him, with real, out-loud words. I’d dreamed about that moment for as long as I could remember, and I was a little surprised at how silly it felt. I mean, of course I was thrilled that the love of my life was asking me to marry him. But I think what I didn’t understand at eight, or even at sixteen, was that a proposal is not a goal in itself. It’s a way of getting to a goal, of getting to marriage, which is vital and permanent. Wow. If there is anything we have learned from this entry, it is that apparently my husband’s absence makes me inclined to blather even more than usual. I absolutely must go to bed. In conclusion: we got engaged! It was fun and had good results, and I would absolutely recommend it. Happy Valentine’s Day! Today is Cycle Day 1. I got the first signs last night, which means I've known for more than twelve hours and yet I haven't cried once, not one single tear. Last month I only made it back from the edge because of the words of Sirach (sent to me at exactly the perfect time by a friend - no coincidence, that). Last month I actually allowed myself to lie on the floor and cry, and I'd long since given that up. I know how to make it when I'm depressed. I get up, get dressed, make plans for the day, get out of the house. It works. But this feels different. I don't know what will work on this, this numbness that pushes itself into the corners of me until I'm afraid to move them for fear that they'll snap. Or, ha. Maybe I do know how to get myself out of this, because the tears are here now. Two paragraphs, that's all it takes. Writing always works. Someday I want to be able to give the world words that aren't salt-encrusted. I store my contact lenses in a case with sterile saline and if I don't rinse the case, the saline dries into little white crystals all over it. That's how I think my words would look if you could see them - frosted with the remains of the tears I cried while writing them. In Harry Potter, Professor Dumbledore pulls his memories out of his temple with a wand. Would that I could get my words that way, but no, they must come stubbornly through my eyes, chapping my face in the process. Sometimes they come so quickly that I can't capture them until they've stopped, and somehow that capturing is never as apt as it should be. I've cried so much over the past months that I should have gone through thousands of tissues... when I cry with other people they always hand me tissues, but I've abandoned their use when I'm alone. Tears dry as well as anything. I barely notice them anymore. Except, of course, when they don't come around. Then I'm looking for them, wondering why they're not here. It seems neurotic to miss the tears, but ever since I can remember they have been my way of dealing with heartache and stress. Writing is secondary; I learned to do it to deal with the tears. I guess it's fitting that now I can do it to get the tears to come. The numbness stymies me, but I know how to deal with the tears. I'll go to a bookstore and treat myself to a big hot chocolate and a novel. I'll make the menu plan and the grocery list and go buy some food to fill our cupboards. I'll play loud, happy music and dance while I cook dinner. And tomorrow, if I find myself staring out the window again, I'll come back to my keyboard (or my prayer journal if that's what I need) and find my tears again. Salt-encrusted words must surely be better than no words at all. If you've been reading for a while (actually, a year, which is very few of you I think) then you remember that I told Bryan's and my love story. I told it at some length, which is not unusual for me, but I didn't talk much about my wedding. But now I've borrowed my parents' scanner and am scanning my little heart out, and I've got wedding pictures to share, so I think it's time to talk wedding. I flirted briefly with the idea of a photo entry, but then I would have to choose only a few photos in order to have mercy on those with slower connections. So instead, I've posted a photo album. If you page through it, you should get an idea of what our wedding was like. Think of the photo album as an entry! or something like that. Then you can come back here and yell at me because the photo quality is so awful (not my fault!) or ask me all kinds of questions like What did we have to eat at the reception? or Wasn't my wedding day the best day of my life? in response to which I will stare at you blankly because I barely remember a second of that whole crazy day. And I definitely don't remember eating during it.